Sports Illustrated has put out a piece on the “Biggest gut-punch loss” for each and every franchise, the Dolphins included. The game that the author the piece, Doug Farrar, picked is an interesting one – a blowout game that was the last in the Hall of Fame career of QB Dan Marino. When the Dolphins hired Jimmy Johnson to be their head coach in 1996, they hoped the coach could build a team that could win multiple Super Bowls—exactly what he did with the Cowboys. Miami never finished higher than 10–6 in four years under Johnson, winning just two playoff games. 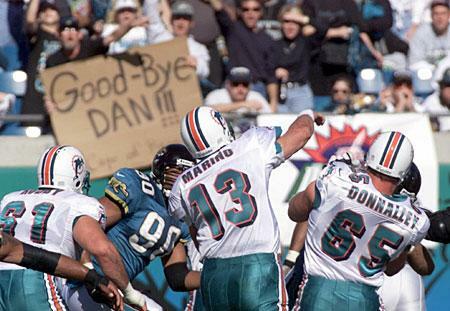 And it was this loss to the Jaguars—marking the end of Johnson’s tenure and Dan Marino’s final game—that was the most agonizing. Miami was hopeful after beating the Seahawks in the wild-card round, but they ran into an unexpected buzzsaw against the Jaguars, who handed them the second-worst postseason loss in NFL history, behind only the 73–0 thrashing the Bears handed to the Redskins in 1940. The Jaguars were up 41–7 at the half, and never hit the brakes. 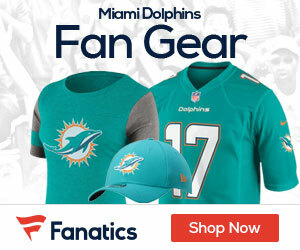 Marino was on the bench early in the third quarter, and the Dolphins amassed just 131 total yards on offense. I was there. Jax stadium was rockin’. Dolphins were dead in the water and the Jags could do no wrong scored on every way possible. Halftime is when most Dolphin fans left. I will say I did not see any posturing or bullys in the Jag fans.I had a Dolphins jacket on too… They were just smiling at the huge scoring difference. Dan had to retire and Jimmy Johnson was out of coaching…….